What a Day! G9 is in the Books. The date was July 31st. 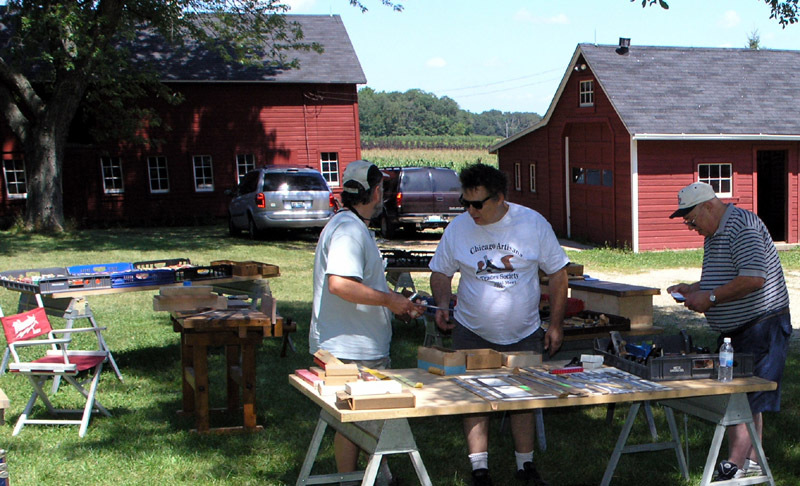 A sunny Saturday near Hampshire Illinois west of the city of Chicago. 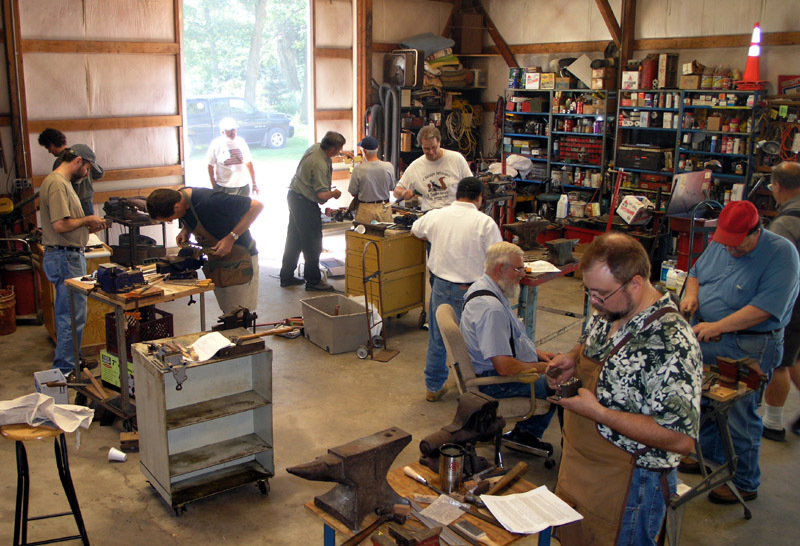 A record number of Galoots gathered together to share their sickness and support their addiction to Old Tools. 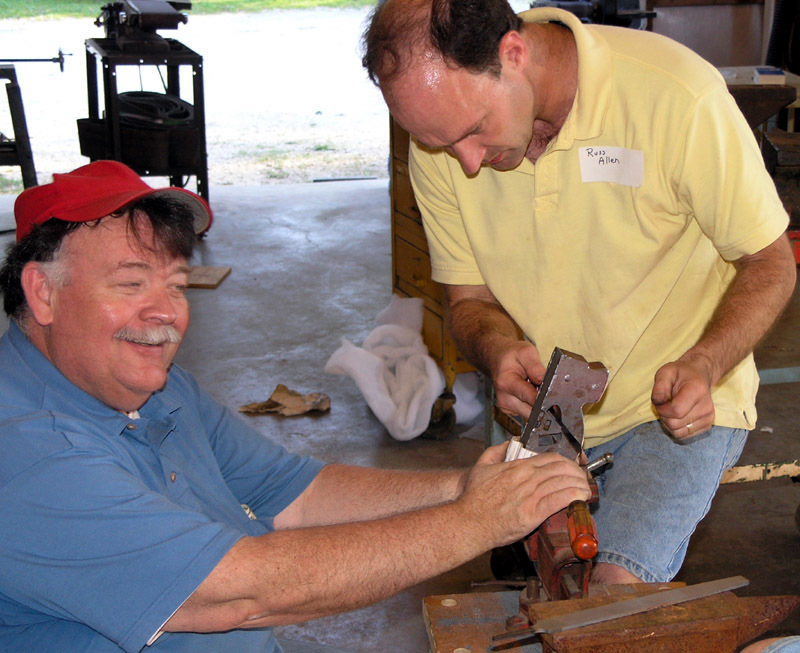 The highlight of the days activities was an infill plane building class taught by Ben Knebel and Doug Evans. 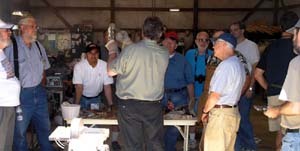 This photo shows an attentive class listening to the Ben's instructions. Altogether about 12 participants purchased kits and assembled some very nice infill planes. 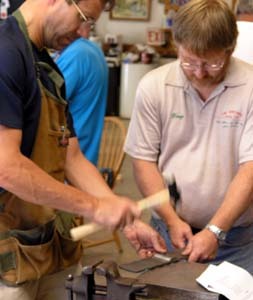 Chariot planes, shoulder planes, smoothers and even a panel plane were all created under the watchfull eyes of Ben and Doug. Not many guys new to the Old Tool world would take a stab at actually making their own infill plane, but Cian (pronounced shawn) Perez jumped right in and built a chariot plane. 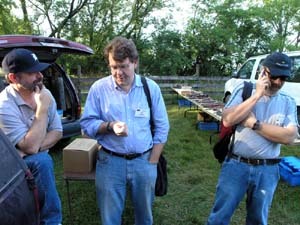 He gained some fantastic experience with the help of both Ben and Doug. You can read his own version of this Galootapalooza experience by visiting his page Here. I'm guessing that this won't be Cian's only planemaking venture. Everyone that I spoke with about the kit said that they were very happy with the product. Some rudimentary tools and skills coupled with patience and a pair of earplugs*; that's all you need to make yourself an excellent working tool. *Lots of peining noise. It's a good idea to protect your ears, whether you're making the plane yourself or with a dozen others in the same room. 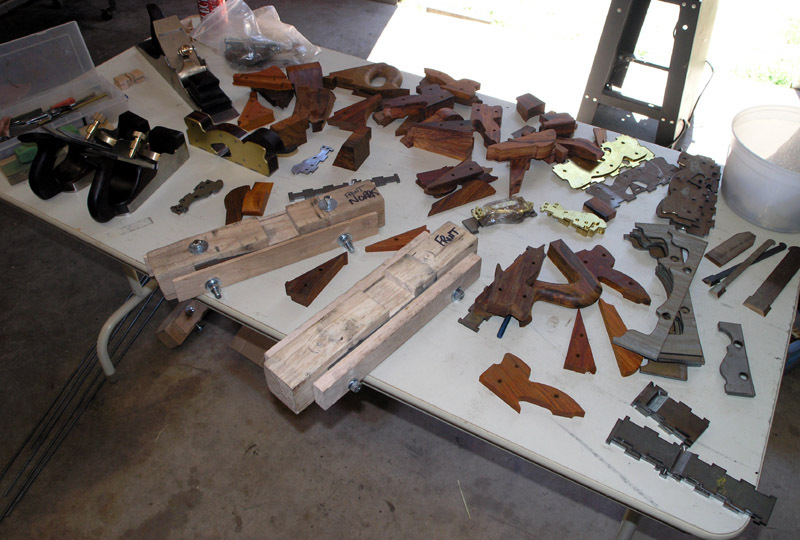 There are a lot of parts that go into twelve infill planes. These are some of the spares that Doug and Ben brought with them. 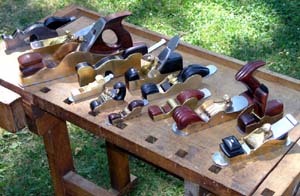 Jigs, sides, soles infills and on the left side a couple of finished planes for the builders to reference while working. 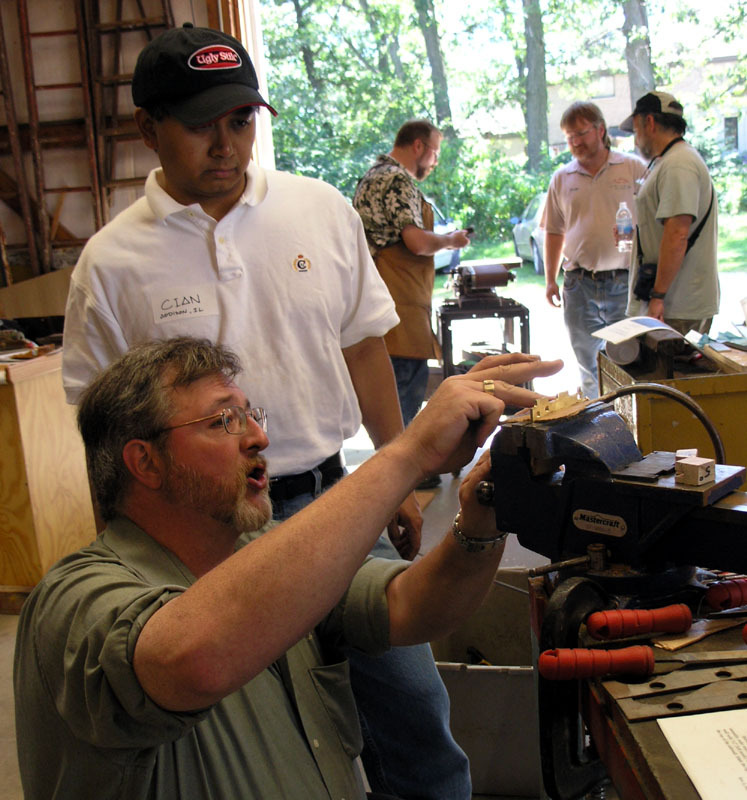 Here Doug Evans helps out Al DaValle with his panel plane kit. That is a big plane with a lot of work involved. The process is the same as with the smaller planes, but with more dovetails, more pins to pein, more infill to build. I hope that we can see a photo of the finished plane sometime. John Meikrantz peins the side of his chariot plane. John completed his plane during the class and what a beauty it turned out to be. Quite gloatworthy methinks. Here we see the "Host with the Most" (room, that is.) 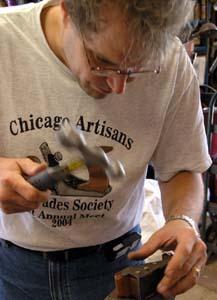 Mike Duchaj as he gets some advise from Ben about fitting the infill on his shoulder plane. Here is as good a place as any to thank profusely, our generous host for putting on two Galootapalooza events in a row. He'll downplay all the work it takes to prepare the event, but trust me, Mike works really hard to bring all this together. The rest of us try to help with organization, but that's all desk work. The farm is in Mike's family and they all give their blessing for the onslaught of addled tool users. I think they understand our problem... Mike's Dad and Uncles have so many antique tractors, trucks and other stuff between them that surely they look at us with our little obsessions and chuckle wisely to themselves. They all deserve our thanks too! Gil is laughing at Ralph, who is apparently sanding his fingers in preparation for that next bank job. College tuition is very expensive these days. Ralph is trying to surmise what is whiter: Gil's shirt or Gil's legs. Or perhaps thhey're just saying "Nice beard." Phil Cannon helps steady the vise while Russ Allen cuts open the escapement of his shoulder plane. Sawing correctly is important because if you take too much metal away, you leave a divot in the side of the plane, and if you leave too much metal you get to file it away for a long time. Action photo of the above scene. I like the picture so I threw it in. 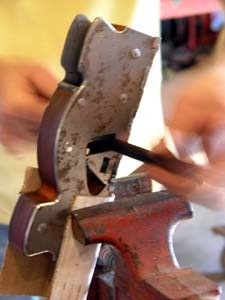 You can see the three areas of attachment that must be hacksawn through, hence the "one-sided hacksaw". While the plane class was going on inside, those of us not participating specialized in relaxing, taking pictures, using Mike's forge and generally hanging out on a beautiful day surrounded by nature's beauty. 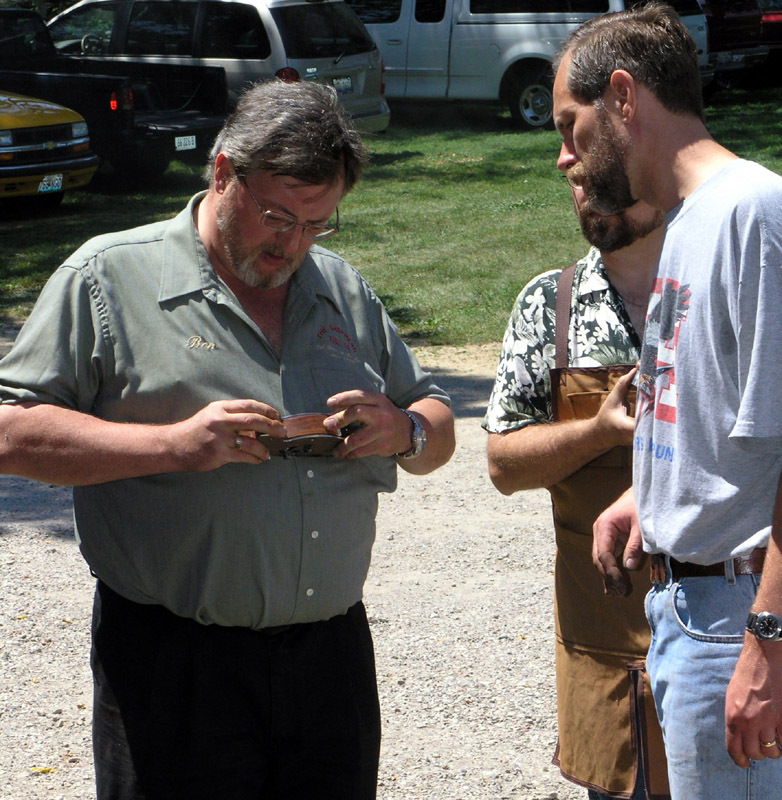 Chicago's very own Slav Jelesijevich came out to support the planemakers with a huge selection of files and rasps for wood and metal. There is a lot of filing to be done on an infill kit and Slav had tools that were useful to everyone. The day's special guest star had to be Wayne Anderson of chilly Minnesota. 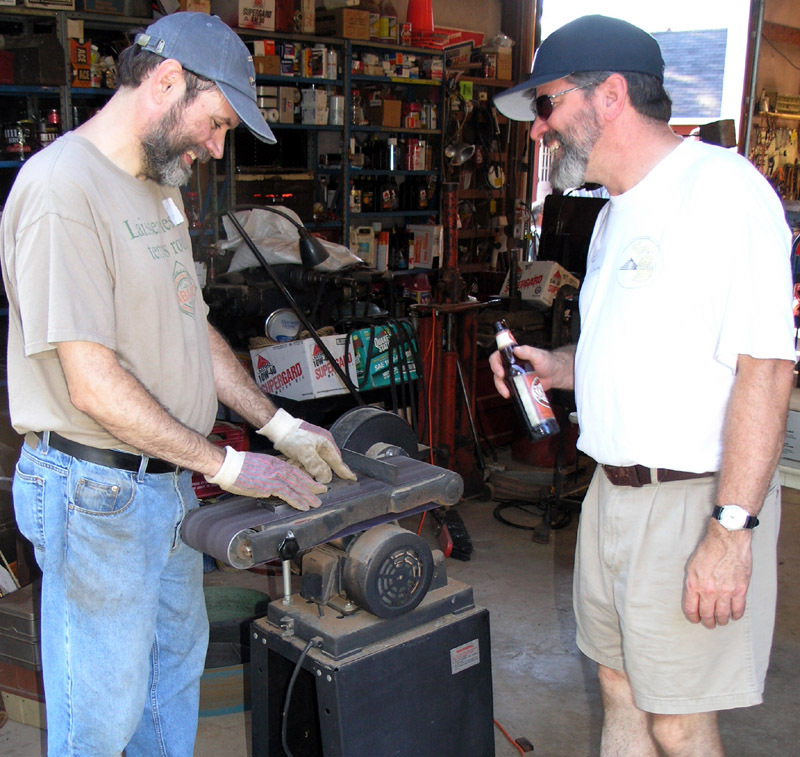 Wayne was interviewed by Chris Schwarz for an article in Popular Woodworking. These beautiful handmade Anderson Planes were assembled for a photo shoot to accompany the interview. 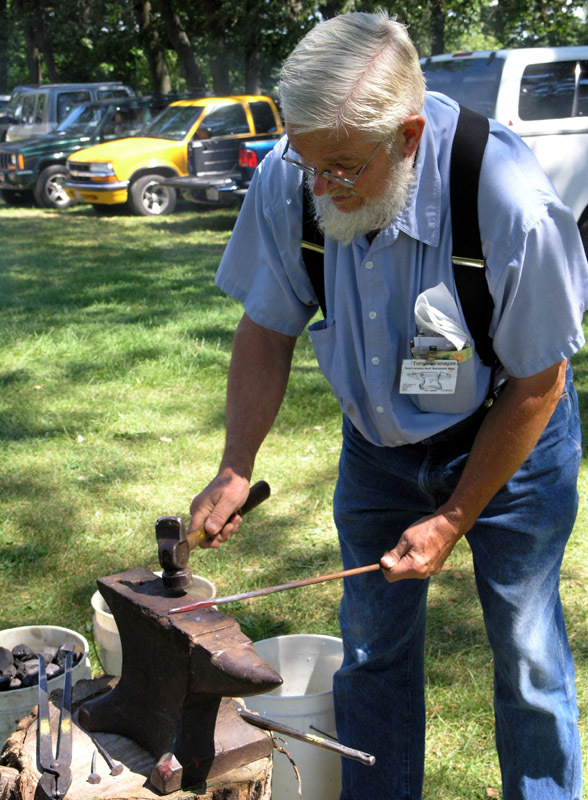 The only real blacksmith in attendance was Tony Vanagas of Tony's Broken Anvil Forge. 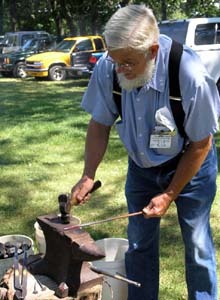 Those of us with a blacksmithing interest really enjoyed watching Tony work the fire and shape the iron. A good smith makes the work look fast and easy. Tony was all that. Here is Jim Vocek, Ben, John Meikrantz, Chris Schwarz and Al DaValle talking about the merits of the Stanley Type 11 plane. 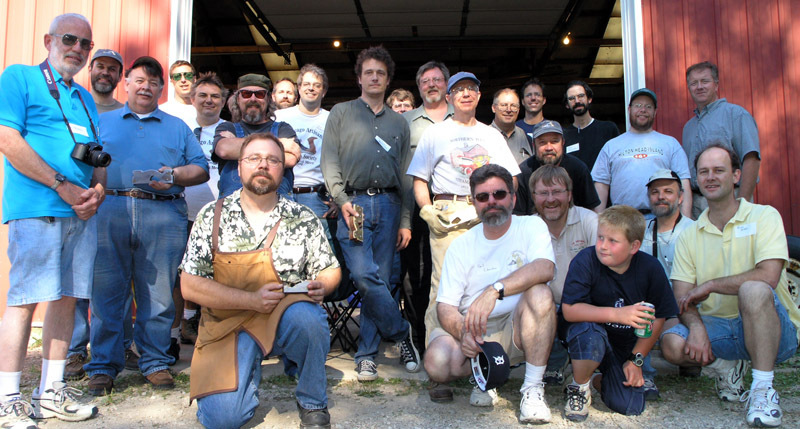 After a great day making planes and hanging out with a bunch of great guys, we took the largest Galoot photo yet recorded. 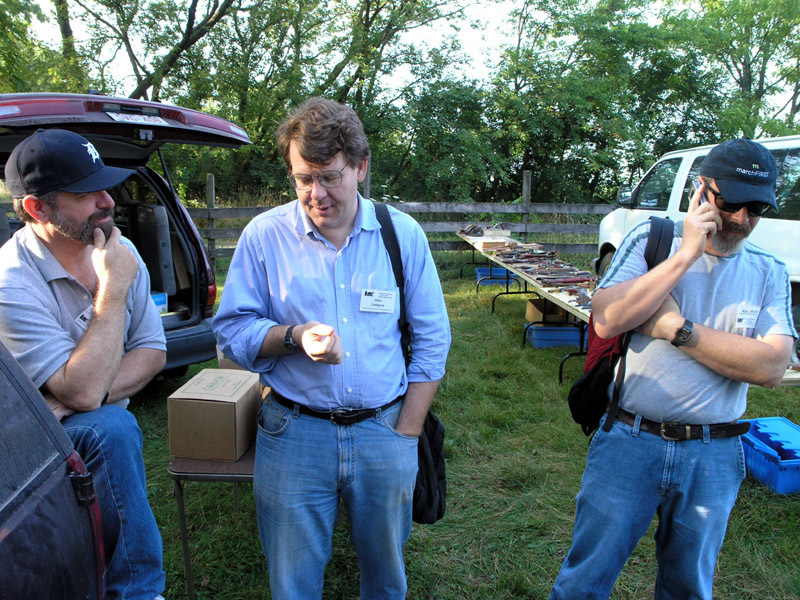 Gil Chesbro, Jim Bodin or Jim Jones(? 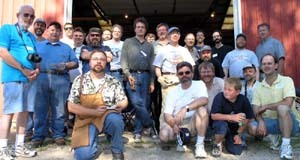 ), Al DaValle, Wayne Anderson, Doug Evans, Chris Schwarz, Doug's son Ashlar, Tad Annhalt, Bill Petersen, Russ Allen and Dave Kasper. Not pictured are at least, but not in any way a complete list: Cian Perez, Scott Wells, Roger Turnbough and the families of Mike Duchaj. Apologies to those who've fallen victim to my faded memory. While we ate dessert, Ben Knebel did a great presentation on the history of the infill plane. Every one took something away from this presentation that they previously hadn't known. Thanks for sharing all of your great research Ben. After the presentation we cleaned up the shop and went to our corners to prepare for the Garfield M-WTCA meet in the morning. I admit that I didn't take enough photos of the largest Garfield meet I've yet attended. As a matter of fact, this is the only one I took. But it's cool. 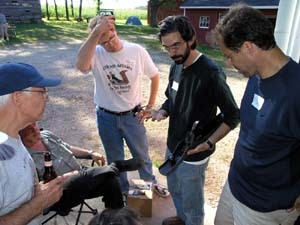 Here Mike Lindgren describes the methods used to discover our universe's smallest identifiable matter, while Gil seemingly defies all known laws of physics by actually being in two places at one time. The viewer should take note that this is a totally unretouched, un-photoshopped image presented exactly as it was captured in the Olympus camera. Next Year... G10! Or is it GX? Stay tuned.